The image of healthy, purifying mountain air is deeply ingrained. Invoked even today, but never proven, the notion that Alpine air will cure your ills is based essentially on the placebo effect and rock-solid faith. Firmly entrenched among the myths of modern society, this belief reveals the paradoxical relations that humans have always had with mountains. To this day, the pitch is still widely used in the Alps. Whether promoting a resort, laundry soap or mineral water, the wonderful effects of pure mountain air are vaunted in every possible manner. An image that is the epitome of good health. Should tourists avoid high altitudes ? That was the question lying at the heart of many research projects on human physiology at the end of the 1800s. Scientific interest in the effects of air at high altitudes and economic interests concerning human health found themselves a joint venture. An approach with a bright future. Alpine architecture in the early 1900s, from small chalets to gigantic sanatoriums, opened to the landscape, air and light. Large bay windows, wide balconies, sunny verandas and galleries, lighter furniture and more discreet interior decorating all reveal a new relation with mountains. Without ever saying as much, poster designers at the start of the 1900s set out to make visible the invisible qualities of the Alpine climate to better seduce tourists. In spite of the specific constraints weighing on the genre, these highly diverse images bear witness as much to the rise of the great health resorts and the artistic trends of the moment as to an increasing mastery of the use of publicity. Banned to tuberculosis patients as early as 1925, the village of Villard-de-Lans in the Vercors decided to reserve its climate specially for delicate children. A judicious (and highly profitable) choice that contributed to the touristic development of this original health resort. Even today, large sanatoriums remind us of the battle launched 150 years ago against tuberculosis. The only remedy at the time was sunshine and mountain air. The patients set off for long periods in the gigantic ship-like buildings in the Alpine setting, cut off from the rest of the world by the fear of contagion. 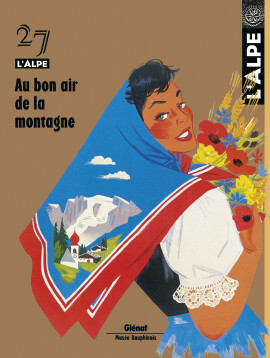 A medical and social phenomenon that marked Alpine landscapes. Literature thrives on pure mountain air. A sanatorium, a self-contained place that encourages the wanderings of the soul, is ideal for writers. Many novels and autobiographic stories portray the dreams and fears of these small groups of people, isolated from the world amid the lofty peaks. A powerful story on the harsh, daily life of patients, suspended between life and death, cut off from the world and subjected to strict discipline. Such is the autobiographic novel of a tuberculosis-stricken poet. In 1942, Jean Rousselot spent time in the sanatorium at Saint-Hilaire-du-Touvet, near Grenoble. Excerpts. Ferdinand Hodler and Ernst Ludwig Kirchner, artists who dealt primarily with mountains, could be termed atmospheric painters. In the beginning of the 1900s, their rendering of the optic properties of air resonated with the stirrings of the soul. But the contemplative and symbolic vision of the first contrasted with the expressionist and dynamic landscapes of the second. Since prehistoric times and until recently, many inhabitants of the Alps ruined their health in the « good mountain air » of the mines. But how was one to resist the mineral wealth that made life down in the valleys possible, before the discovery of « white gold » in the form of ski resorts ? A trip to Alpine mines. Lost along the edges of Siberia, where China, Kazakhstan, Mongolia and Russia meet, the small Altai republic, a part of the Russian federation, is attempting to attract mountain tourists. A road movie on the tchouyskyi trakt .